Need a sweet treat for Mother’s Day? How about a fresh strawberry cheesecake? It’s easy to make, requires no baking, and it’s the perfect way to honor National Strawberry Month. You’ll love this no bake cheesecake recipe! This cheesecake recipe features yummy strawberries, a fruit with lots of nutrients—some of which include vitamin K, folic acid, potassium, riboflavin, and magnesium. Strawberries also have vitamin C; in fact, they have more vitamin C than an orange. Eating strawberries come with many health benefits. They have heart-healthy and anti-cancer properties. And that’s not all. A 2012 study found that eating strawberries more than twice a week could delay cognitive aging. What a great gift for Mother’s Day! If you’re ready to make this easy cheesecake, check out the cheesecake recipe listed below. To make this easy cheesecake, start by lining the bottom of an 8 x 8 pan with aluminum foil. In a small bowl, combine cookie sandwich crumbs with melted butter. Pour the cookie crumb mixture into the bottom of the pan and press with fingers until mixture is compacted. Freeze for 15 minutes. Make whipped cream by whipping the cream until you form stiff peaks. Add powdered sugar carefully. Fold in the homemade whipped topping into the cream cheese mixture, and stir until combined. Add 1 cup coarsely chopped strawberries and stir to combine. Pour half of the cream cheese filling on top of the crust. Scatter the sliced strawberries on top. Then add the remaining cream cheese mixture. Refrigerate for at least 5 hours or until set. Garnish the top of the cheesecake with extra strawberries. Cut into squares and serve immediately. Bonus. Not a big fan of strawberry cheesecake? 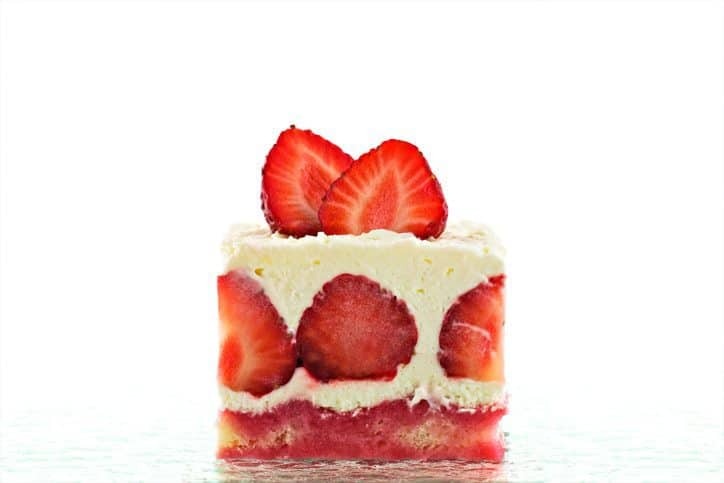 Want other recipes for Mother’s Day and National Strawberry Month? Try chocolate covered strawberries or strawberry shortcake. They’re absolutely delicious!